I’m working on a three-and-four month update to post next week, but something came to mind tonight and I wanted to share it now. The longer Violet is here, and the more our hearts knit together, the harder it is to not regret all the time we lost. And I made this cover picture for Facebook in summer 2013 because I was so tired of waiting. 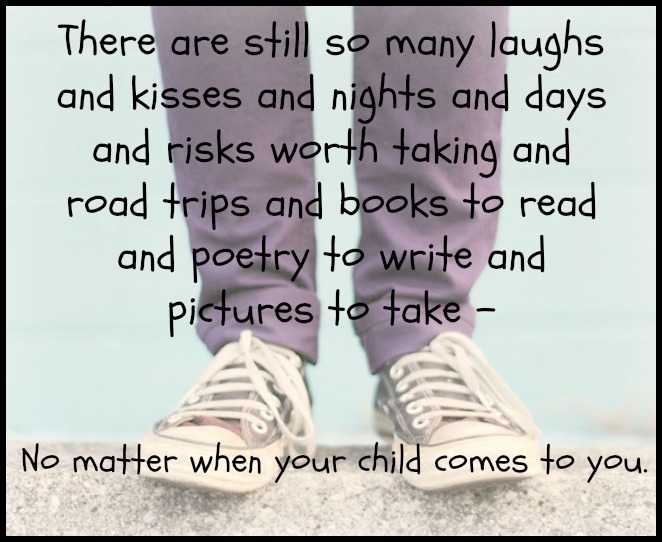 This sentiment rings true for most adoptive parents of older children: we miss all the time we didn’t have with our kids in the years before they came. And the more we grow to love them, the harder it is to realize how awesome they are and what all we must have missed. That kind of stuff will Break. Your. Heart. Isn’t that just the most wonderful realization? There is still so much fantastic-ness ahead of us that I can’t even articulate it all! And what a gift that I — little ol’ nobody Me — gets to experience being this sweet girl’s mother, no matter how long or short our days together. I mean, honestly — how freaking fabulous is that?